In 1929 Fitz Herbert took on a new general manager, Leon Bagrit. Bagrit had arrived in Britain at the age of 12 in 1914, with his parents who had fled from the Ukraine. After reading law at Birkbeck College, London University, he joined Messrs W. & T. Avery in London, where he was soon promoted to divisional manager under Lord Mills. The recruitment by Herbert & Sons was no doubt seen as quite a coup, but the 27 year old Bagrit had ideas and a drive that Herberts found difficult to handle. 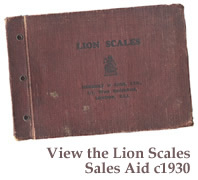 Bagrit produced a very well designed sales aid ‘Light on the Lion’, a 67 page hard cover book with 57 photographs, but with the depression already starting, this could have been seen as an unnecessary expense. Although he had no formal engineering training, Bagrit registered 2 patents whilst with the Company, one for weighing machines and the other for meat mincers, but in 1935 fell out with Fitz and left to form B & P Swift Ltd to exploit his own patents and designs. Swift soon became a serious competitor with a large factory on the North Circular Road, as this immediate post WWII brochure demonstrates. It was put together by a very high calibre team, the text being written by Maurice Edelman, an MP and former WWII war correspondent, and the photographs taken by Felix H Man, chief photographer of the Picture Post from 1938-45. A note from Jim Herbert written in the 1990s says 'Bagrit did some very advanced thinking in respect of automatic scales. He left H&S when Mr Fitz Herbert refused to adopt his proposal for what he later declared was a ‘Meccano’ machine. Bagrit then set up his own company, a thorn in our side until 1960'. Simon Lavington (who by coincidence taught the present Chairman at Manchester University) covered Bagrit's career with us in his book Moving Targets: Elliott-Automation and the Dawn of the Computer Age in Britain 1947 – 1967, published in 2011 by Springer Science & Business Media. 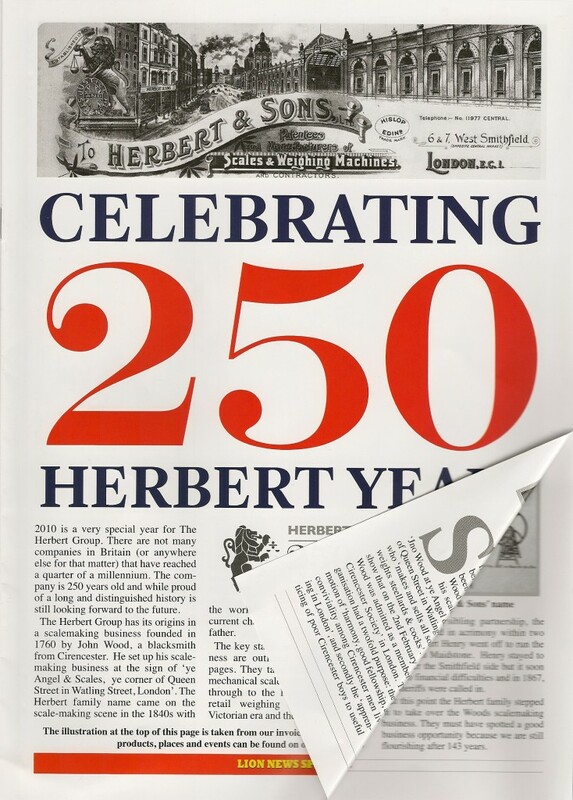 It was always said while Herberts in WW2 turned its production almost totally to war work, Swift maintained its scale production, so in 1946 was one of the only companies that were able to start quickly back into the manufacture and supply of retail scales and mincers. In 1947 Bagrit arranged for Elliott Brothers to take over Swift, and he become managing director and later chairman of the whole company. One of the most successful entrepreneurs in Britain of his time, he was knighted in 1962 and gave the 1964 Reith Lecture entitled The Age of Automation, in which he predicted both hand held computers and the internet. Elliotts was one of the three companies that later came together to form ICL, Britain’s attempt to form a global computer business as a competitor to IBM. In an interesting parallel, IBM itself had been created in 1911 as the Computing-Tabulating-Recording Co. (C-T-R) by merging three companies, the Computing Scale Co. of America (1901), the Tabulating Machine Co (1896) and International Time Recording Co(1900). At that time CTR sold machinery ranging from commercial scales and industrial time recorders to meat and cheese slicers, tabulators and punched cards, changing its name to International Business Machines in 1924. ‘Perhaps the most far-reaching use of the new generation of computers will be in the retention and communication of information of all sorts within a national, possibly a world-wide, information system. ‘In many industrial and commercial applications we are moving steadily away from large, centralized computers towards much simpler decentralized units, systems of small, cheap, special-purpose units, rather like building bricks. Our thanks to Christopher Bartlett of Rochester Avionic Archives for coming up with the copy of 'Swift - The factory of tomorrow, today! '.